The Perth CBD is perfectly situated on the northern bank of the picturesque Swan River and incorporates a number of high-rise office buildings and shopping malls filled with all sorts of different retail outlets. There is also a large range of luxury hotels and apartments in Perth that have accommodation to suit the needs of every type of traveller. 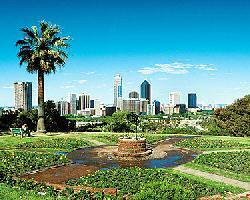 Along the river front in the CBD there are a number of fine dining restaurants and just a short distance from the city centre is the wide expanses of Kings Park, which provides lots of great walking tracks and some truly amazing views of the Perth CBD and Swan River. Also located in the CBD and close by in the nearby suburbs of Northbridge, East Perth and West Perth and a large selection of cosmopolitan cafes, trendy bars, nightspots and tourist attractions like the art galleries, markets, parliament house and museums. The Perth CBD is quite an easy place to get around with extensive train & bus services including the free CAT (Central Area Transport) bus service. Fremantle is not only one of the most popular places for tourists to visit in Perth but it is also a very popular place to stay. This is because there is a range of quality accommodation available to suit the needs of all types of travellers, the harbour and beach are close by and you can easily catch a train, ferry or even drive into the Perth CBD. The most famous place to see and be seen in Fremantle is along Marine Terrace and the foreshore, where you will find an array of different place to eat and great views of the sun setting over the Indian Ocean. In Fremantle you will find the Western Australian Maritime Museum, the University of Notre Dame and lots of fun and exciting activities for the kids to enjoy. Fremantle is predominately a boating and shipping port, but tourists and visitors can also enjoy taking a ferry ride from Fremantle out to the unique attraction of Rottnest Island or along the beautiful Swan River into the city centre. The city of Perth has some truly amazing beaches and nowhere will you find a better example of this than along the Sunset Coast of Western Australia. It is a vast region that begins at Cottesloe on the coastline of central Perth and extends northwards for 50 approximately kilometres. The Sunset Coast includes a number of white, sandy beaches including City beach, Scarborough, North Beach, Sorrento Beach, Hillarys Boat Harbour which incorporates the aquarium of Western Australia, Mullaloo Beach, Burns Beach, Mindarie and Two Rocks which is the northernmost beach in Perth. Right along Perth's Sunset Coast there are lots of motels, hotels, self contained apartments and even B&B's where you can stay in comfort and watch the amazing sunset as the sun goes down over the Indian Ocean, whilst still be close enough to all of the main tourist attractions and corporate offices in the Perth CBD and surrounding suburbs. Some of Perth most prestigious houses are located in South Perth because this inner city suburb provides a quite and relaxed place to stay whilst being conveniently located just across the river from the Perth city centre. South Perth is surrounded of 2 sides by the wide expanses of the Swan River, ensuring than many properties have great views of all the yachts and boats making their way along the waterway. 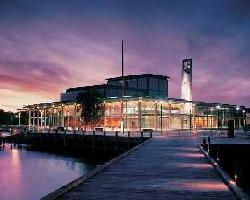 There are numerous parklands, gardens and recreational facilities located along the banks of the river in South Perth. There is also a number of shopping strips in the suburb where you find everything that you need for your stay or even enjoy a delicious meal at a nice restaurant or cafe. If you choose to stay in South Perth then you will not only be close to the CBD, but will also be right next to the Perth Zoo and the Royal Perth Golf Club, which are both situated in South Perth. Another easy and convenient way to get across the river and into the city centre is to take the ferry from the Mends Street Jetty to the Barrack Street Jetty. The exciting and vibrant inner city suburb of Northbridge is ideally situated just north of the Perth city centre. It is filled with lots of different things to see and to do, as well as being home to some affordable hotels and a range of budget backpacker hostels. One of the main attractions in Northbridge is the Perth Cultural Centre, which is located just north of the Perth train station. 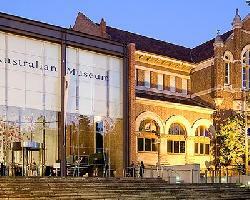 This centre includes a number of different buildings including the Art Gallery of Western Australia, the State Library of Western Australia, the Western Australian Museum, the State Theatre and the Institute of Contemporary Art. Also surroundings this area there are numerous restaurants serving all sorts of different cuisines, lots of trendy wine bars and an assortment of nightlife entertainment that is sure to suit the tastes of all visitors to Perth. Northbridge all includes a number of colleges, tafe campuses and schools, as well as shopping plazas and cafes serving delicious lunches and great coffee. Whilst not exactly in Perth the seaside city of Mandurah is a popular place for local, interstate and international people to visit because it provides all of the facilities of a big city but with the relaxed atmosphere of a beach holiday resort. Mandurah is conveniently positioned just a short 50 minute drive south of the Perth CBD along the Kwinana Freeway. This makes it ideal for couples looking for a romantic weekend away, holiday makers who are after a central base from which to explore all of south west WA or even for business travellers who would like to stay in relaxed surroundings and don't mind commuting into the CBD to do their business. Mandurah is situated on the banks of the large inland Peel Inlet, which is connected to the Indian Ocean by the Mandurah esturary. All of these nearby waterways provide lots of sheltered areas for all sorts of boating activities, as well as some excellent fishing opportunities. As the Swan River winds its way through the Walyunga National Park it enters the fertile soils of the picturesque Swan Valley. This region of the outskirts of Perth extends all the way from Bells Rapids down to the suburb of Guildford, which is just north of the Perth International Airport. Throughout the Swan Valley there are a number of small townships that each has its own unique character and charm. These include Middle Swan, West Swan, Herme Hill, Henley Brook, Millendon, Baskerville and Upper Swan. Visitors to Perth can either choose to stay in the relaxed country surrounds of the Swan Valley or take a scenic day trip and explore the natural wonders and taste the fresh local produce that this region is famous for. 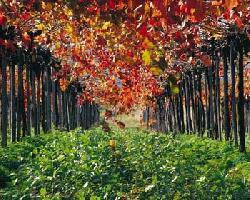 There are also a number of large wineries that operate in the Swan Valley, as well as some small family owned vineyards and microbreweries that produce some excellent beers. If you are travelling to Perth during the month of October then you will definitely want to check out the 'Spring in the Valley' food and wine festival that is held each year in the Swan Valley. Perched high on a hill the expanses of Kings Park overlook the beautiful Swan River and provide an excellent place for a relaxing walk or family picnic. Take the whole family to the Perth Zoo for a day of fun and excitement. It is ideally located in South Perth just over the river from the CBD. For an exciting night out head along to the Burswood Casino, which is east of the CBD, and enjoy a delicious meal, see a show or have a gamble on the many tables and poker machines. The Perth Cultural Centre is conveniently situated just north of the city centre and includes numerous galleries, museums and centres of visual & performing arts. The port City of Fremantle is a very popular place for locals and tourists because it has a relaxed feel, lots of fine dining and plenty of fun places to visit. Spend a relaxing day having fun and soaking up the sun at Scarborough, City or Hillarys Beach on the beautiful Sunset Coast. 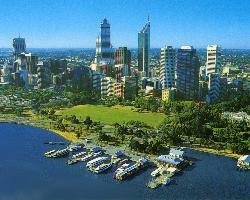 For a unique experience in Perth why not take a boat ride or cruise along the expanses of the beautiful Swan River. The golf enthusiast will enjoy playing a round of golf on the Cottesloe, Royal Fremantle, Mount Lawley or Royal Perth golf courses. If you have a day to spare you should take the ferry to Rottnest Island and experience all that this wonderful island has to offer. For great alfresco dining head along to the Fremantle Esplanade and enjoy the fresh local produce at one of the many fine restaurants. 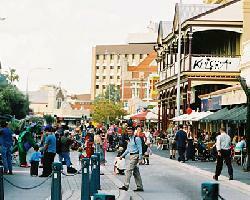 At night time experience the nightlife entertainment in Northbridge, which is just north of the Perth CBD. The retail stores and boutique fashion shops in the Hay Street Mall are a must visit for people who love to shop. The Garden City Shopping Centreis located in Booragoon, 8kms south of the CBD and features a wide range of fashion, lifestyle and food stores. You will find the Centro Galleria shopping mall north of the city centre in the suburb of Morley. It is open until late 6 days a week and has a huge variety of different shops and retail stores. The major shopping centre of Westfield Carousel is situated in Canington south east of the CBD and has hundreds of big name shops, department stores and boutique fashion outlets. Nestled in the city centre London Court is a unique shopping experience with lots of boutique shops set in a Tudor England atmosphere. Patersons Stadium is home to AFL matches and is conveniently positioned in Subiaco just a short drive or train ride west of the Perth CBD. The WACA or West Australian Cricket Ground is where all the international and state cricket happens and is located in East Perth near the river. The Burswood Dome is situated over the river from the CBD in Burswood and hosts major basketball matches, concerts and tennis tournaments. Located 8kms east of the city centre the Ascot Racecourse hosts many major race meetings and is the Ascot is headquarters for horse racing in Western Australia. The State Tennis Centre in Perth is positioned just 5 minutes east of the CBD and has lovely views of the city, Swan River and Burswood gold course. Nestled on a sweeping bend of the Swan River the Belmont Park Racecourse is only 3kms east of the CBD and holds many horse races during the winter months in Perth. The Gloucenter Park Trotting Ground is right on the banks of the Swan River in East Perth and has lots of night and day races throughout the year.